Kraftwerks Performance is pleased to announce that our upgraded supercharger kit for the Subaru BRZ, Scion FR-S, and Toyota FT86 is now available! Kraftwerks Performance has taken the core components of the extremely popular CARB Legal Supercharger Kit and added redesigned supercharger mounting brackets, wider drive pulley set, and a more robust 30mm belt. The wider belt is 57% stronger than our previous offering; making the new kit the most reliable and best-performing supercharger on the market! Performance and reliability are what you get with Kraftwerks Performance! 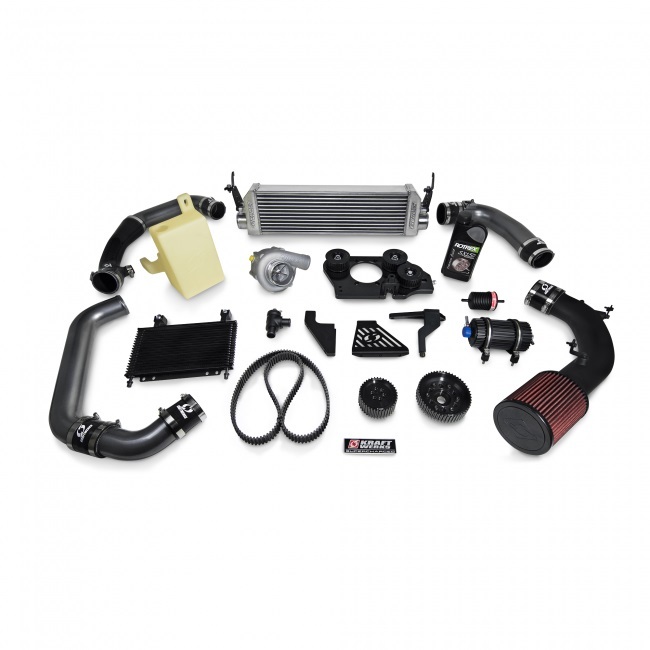 At 9psi of boost, the Kraftwerks Performance CARB Legal Supercharger Kit consistently produces 270 whp and 200 lb-ft. of torque on 91-octane and through the OEM header and exhaust. That’s a 62% increase in power!! If you are up to the task of switching to E85 and you already own a Skunk2 header and exhaust, you will be enjoying gains in the neighborhood of 74%. The numbers are enough to get any car enthusiast excited but more impressive than the peak numbers is the linear power curve you get, making your vehicle a blast to drive regardless of where you are in the RPM range!